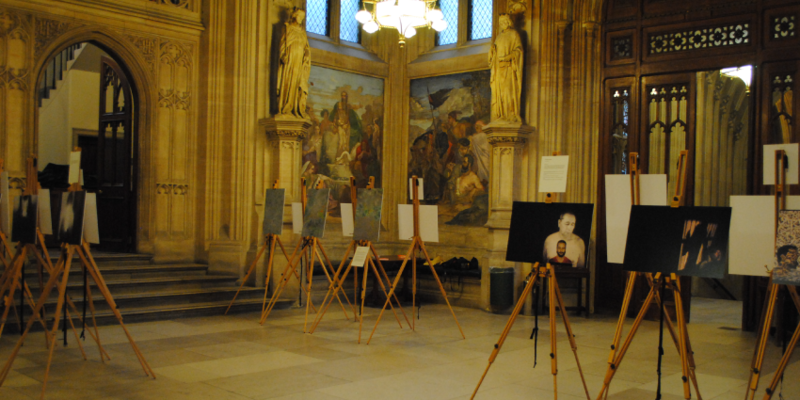 What is “Everyday Politics” and why have we been celebrating it with a photo exhibition at the Palace of Westminster? 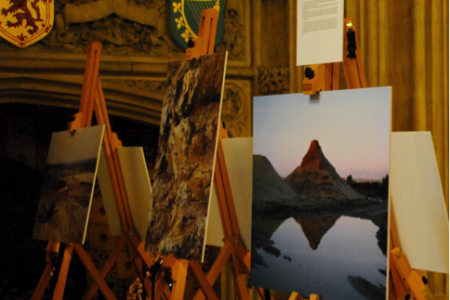 In this blog Dr Holly Eva Ryan explains why the Crick Centre and World Photography Organisation have teamed up to celebrate everyday politics with a photo exhibition at the Houses of Parliament. This year, The Crick Centre teamed up with The World Photography Organisation (WPO) to launch a competition open to photographers-in-training. The competition ran off the back of the Sony World Photo Awards’ Student Focus strand and it was premised on exploring “everyday politics” from around the world. 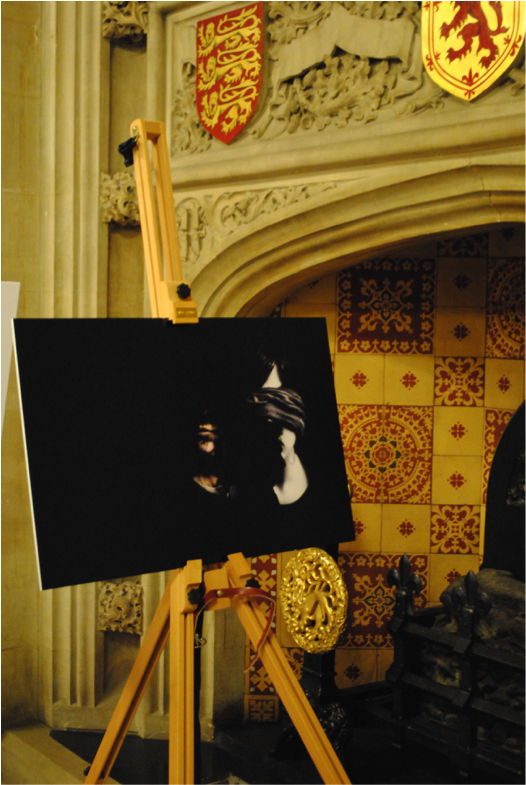 This was an exciting process to be involved with, particularly as the competition gave students the opportunity to showcase their work at the Palace of Westminster. But just what is “everyday politics”? Well, I think it depends who you are. For the student photographers that entered our competition, “everyday politics” meant a variety of things: from the value that Australian photographer, James Farley attributes to gardening and stewardship as a counter to global warming, to Man Yan Katherine Ngai’s visual narrative on memory and the Umbrella Revolution in Hong Kong. For me, the term “everyday politics” serves as a useful umbrella for a whole spectrum of activities. These range from the community-building and voluntarism highlighted in Henrik Bang’s concept of ‘everyday-making’, to actions that playfully challenge or subvert the status quo, which are the focus of Bakhtin’s work on folk culture and James C. Scott’s explorations of ‘everyday resistance’ to oppressive regimes. Our everyday political expressions are important, not in the least because they reveal a creative, dynamic and engaged citizenry that can – and does – act in various ways to build the kind of society it desires. This is, if you will, a kind of ‘DIY politics’. I would venture to say that “everyday politics”, in its various guises, forms the backbone and even greases the wheels of the political system as a whole. Through volunteer work, campaigning, demonstrating, staging art actions and debating issues on and offline (See Knobloch and Gastil in Politics 35(2) on civic re-socialisation and deliberative fora), we forge social connections, we create spaces for listening and opportunities for learning that shape us as voters. But, political practice is about so much more than the ballot box, clearly. And, when it comes down to it, many of us are “doing it ourselves” on a regular basis. The overwhelming public response to the current refugee crisis – including local food and clothes drives, fundraising, ad hoc housing solutions, social media campaigns and widespread demonstrations – is an obvious case in point. We achieve a great deal through our “everyday politics”, and yet, we all too infrequently celebrate these achievements. I, for one, think we should take pause to reflect on them – and what better place to do so than in the Palace of Westminster? This exhibition was more than a celebration of everyday politics, it was also a showcase and testament to the power of art. This is something we explore in the Political Studies Association’s Art and Politics Specialist Group. I also write and research on art as resistance, which means I do a lot of thinking about contention, discord and dissonance. Yet, as I was installing and mounting the photographs in the Upper Waiting Hall last month, I was reminded of another reason that art is so very important to politics. Academic jargon aside, I think this can be said rather simply: art connects people. The Upper Waiting Hall is a thoroughfare for politicians travelling to and from meetings in the committee rooms. Services staff regularly criss-cross the space as they go about their duties. It is also one of the locations visited on special tours of the Houses. This constant bustle of people made the job of mounting the students’ photos unexpectedly lengthy. I was stopped at regular intervals by passers by, eager to learn more about the prints. This was my fourth visit to Parliament and never before had I felt so popular! 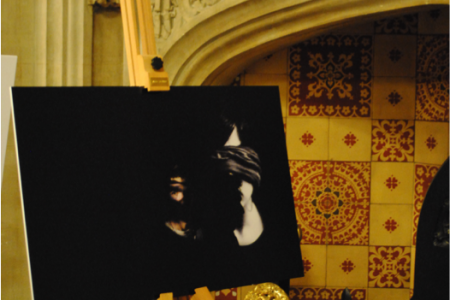 “Can you tell us some more about the exhibition?”, was a common question from MPs and support staff. “How does Parliament decide what art to display?,” was another. “Are you one of the photographers?”, the House Postman asked me; “I wish I were that talented!” I replied. After chatting about the exhibition, a few even ventured to ask me about the frescoes on the walls, assuming that I was a resident art historian. 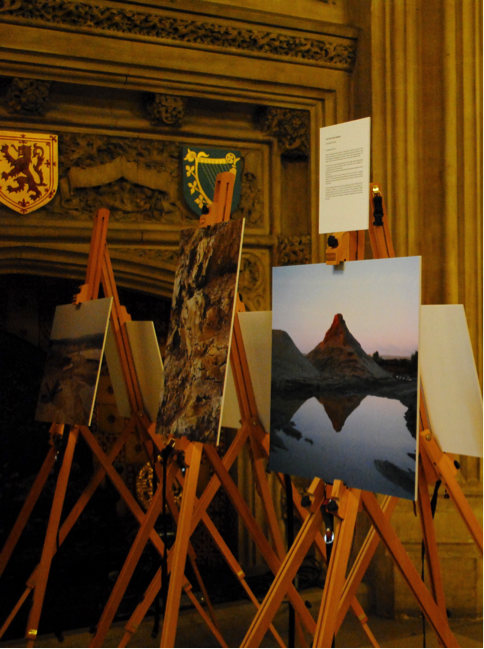 I’m fairy certain that my lack of knowledge about the Parliamentary art collection disappointed them but it was nonetheless fascinating to observe how the exhibition space came to life with conversation and contemplation as the photographs went up. The broader point that I’m trying to make is that works of art – in this case photographs – can provide a talking point, they give us a reason to engage with one another when we otherwise wouldn’t and they can often offer a way into politics that is frankly, more fun, more creative and more appealing than some of the established institutional channels. From 14-18 September 2015, twenty of the best photographs from The Crick Centre/World Photography Organisation’s “everyday politics” competition were on display in the Upper Waiting Hall. “When considering ‘Everyday politics’, I decided that I wanted to pursue my work within the Landscape, as it has been an underlying topic that has featured in shaping the photographer I am today. I chose to look as the landscape as no longer a ‘place’, but … as an area of purpose. (Mitchell, 2002) … I chose to examine the Dorset coast of Britain and it’s large industry of quarrying and mineral extraction. With environmental issues plaguing our contemporary culture, it made sense to address these sites and experience them whilst in their presence, especially as these sites have an everlasting effect upon the world of which we live in. To me, this is everyday politics”. Through their photographs, the student photographers coming from as far and wide as Hong Kong, Australia and Argentina, have given us a privileged glimpse into their worlds, including the political practices and issues that affect them most directly. The competition winner, Lucia Morón from the El Aire School in Argentina, produced a series of striking portraits exploring the lives of political activists. Her sitters work across a range of issues from the protection of indigenous rights and campaigning against animal cruelty to investigating the disappearances of persons. In a recent article in Politics 34(3), Earnest and Fish discussed the important role images can play in pedagogy and teaching politics. This importance stems in part from the fact that photographs connect with us emotionally. They have the power to hook us in, make us think afresh and sometimes they can inspire us to act (Bleiker and Kay 2007). As somebody who has spent time interviewing former activists across Latin America, I was especially moved by competition winner, Lucia Morón’s captivating series of portraits from Buenos Aires, entitled ‘One for Each’: that is one portrait for each activist who has devoted his or her leisure time to a pressing social concern. But, with power comes responsibility. 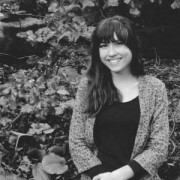 At the Crick Centre we look forward to welcoming Lucía Morón as our new photographer in residence and collaborating on projects that explore the issues of political engagement, power and responsibility within photographic practice. We also keenly await one of Politics’ upcoming Special Issues that will further explore the politics of the everyday. Holly Eva Ryan is a Senior Lecturer at Manchester Metropolitan University.